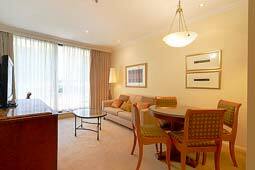 These tastefully appointed fully-furnished studio, one bedroom and two bedroom apartments are located in the prestigious banking and financial precinct of Sydney near the Rocks. Most apartments offer expansive views over Darling Harbour and the Barangaroo development, whilst some offer excellent city views. 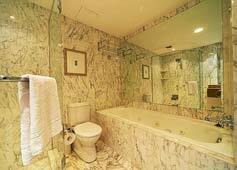 This self-contained corporate accommodation is appointed with spacious marble bathroom with bath and separate shower, large balcony, fully equipped kitchen with marble bench tops, internal laundry with dryer facilities, TV, Stereo, reverse cycle air-conditioning. The Apartments have separate bedroom and living area as well as a large balcony with water views (on request). 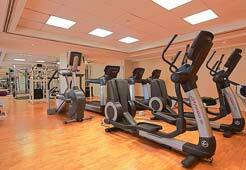 Corporate relocations to the Kent Street Apartments also offer full use of the resort-style facilities such as indoor pool, gym, spa and steam room. 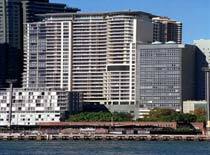 The apartments are within easy walking distance of the Harbour Bridge, Opera House and the Rocks, with countless shops, specialty boutiques within easy access. The atmospheric restaurants and bars of the Rocks are are minutes’ walk away as are the trains and ferries of Circular Quay and Wynyard Train Station. Studio and one bedroom apartments provide Queen-size Bed or King Bed with built-in Wardrobe Space. 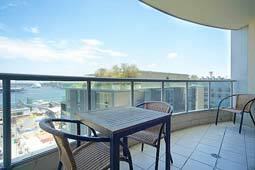 The Apartments also have a balcony with views across Darling Harbour or the city. 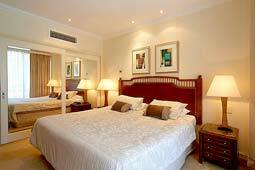 Two Bedroom Apartments are configured with King and Queen Bed. It may be possible to book a Queen and 2 Single Beds in some two bedroom apartments also. The Two Bedroom Apartments have a single bathroom, separate living area, fully-equipped kitchen with dishwasher and oven, internal laundry and dryer as well as study desk nook. 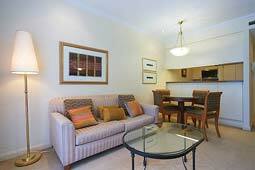 Overall the apartments are a very good accommodation option for those intending an extended stay in Sydney's Central Business District whether it be a corporate relocation or a holiday to Sydney where the space offered by a hotel room is not able to provide the luxury of self-contained living. Fully equipped kitchen including dishwasher and oven. Inclusions: * The above rates include utilities constrained to ‘normal’ usage, up to approx A$30 per week. Note, normal usage is considered to cost below A$30/week. This condition is intended to exclude coverage in the weekly rent for excessive usage such as: leaving the air-conditioner/heater on all day when the apartment is not occupied. Key Loss: Replacement keys will cost AUD$200 per set. If keys are locked into the apartment it may not be possible to get back into the apartment outside of business hours. A call out fee will apply up to AUD$200. Deposit & Rent: A deposit equal to the first month’s rent is payable at the time of booking. The cost of the departure clean is also charged at the time of making the booking. Remaining Rent is payable monthly in advance. Internet: A USB wireless dongle can be provide at a cost of $70 per week. Parking: Secure parking is very limited, and not available with all apartments. Parking is for residents only. Smoke Alarms: Please note, where the smoke alarm is triggered by smoke in the apartment (from cooking, smoking etc) the guest will be charged the attendance fee for the fire brigade. This cost is AUD$870 per call-out but is subject to change without notice. Please note the apartment is non-smoking, though smoking is permitted on the balcony - given due consideration for other guests in nearby apartments. Rates and conditions as confirmed at the time of booking will prevail.